A few months ago the Pole to Pole Campaign also landed in Mulhouse Zoo, France. The title of the Mulhouse campaign ‘Pour la banquise, pense à ta prise’ can be freely translated into ‘For the icepack, unplug your phone jack’ to promote personal involvement in the fight against global warming. 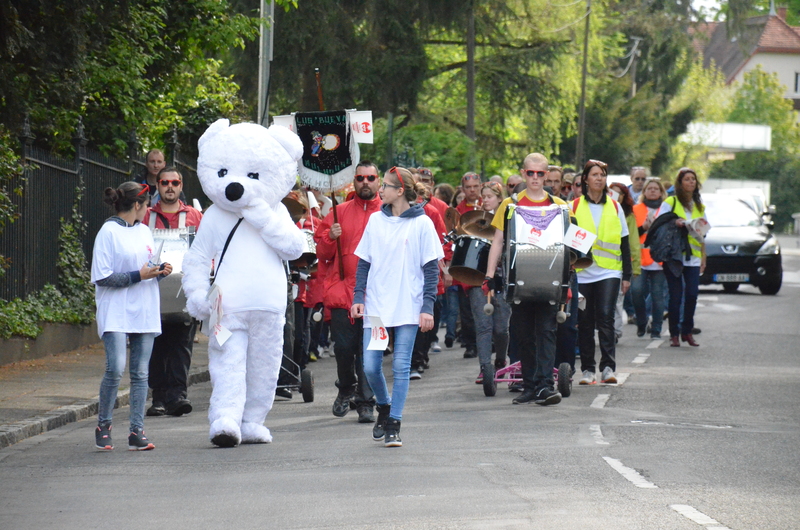 The launch of the campaign kicked off with a great parade from the zoo premises onto the streets and to the city center whilst being accompanied by a jolly local marching band. A lot of observing people enjoyed the scene, and the participants in the march had a great time. In the city center of Mulhouse, in direct contact with the observing public, Mulhouse Zoo participants gave away performances of comedy and theatre, free hugs, and embarked on face painting activities thereby emhpasizing what we can really do to stop wasting energy. A funny game in a model apartment was also set up, while playing the game you had to find all energy-consuming objects and unplug it as fast as you can! Mulhouse Zoo will continue with the ‘For the icepack, unplug your phone jack’ campaign the upcoming summer and fall. The aim is to make as many, if not all, zoo visitors aware of climate change and to stimulate personal action in lowering energy consumption.